If you’re sending content-rich newsletters to your clients and prospects, congratulations! You’re doing a great job of keeping in touch and I’ll bet you’re getting new business because of it. But if you’re not putting that same content on your website, you’re missing an opportunity to reach a world of consumers who’re looking for the services you provide. Since you’ve taken the time to create the content, why not put it on your website so new prospects can find it? You can still promote it to your email list, but you’ll get the added benefits of (1) receiving organic search traffic to your site and (2) social media exposure. Both of these benefits could help you generate new inbound leads. Here’s a video that explains the process. In the post below, I’ll share a couple common examples of how many businesses send their newsletters and then I’ll show you a way to do it that will knock your socks off with its potential to generate new business. The excerpt below is from an email newsletter I received recently from a friend of mine who is a mortgage lender here in Portland. 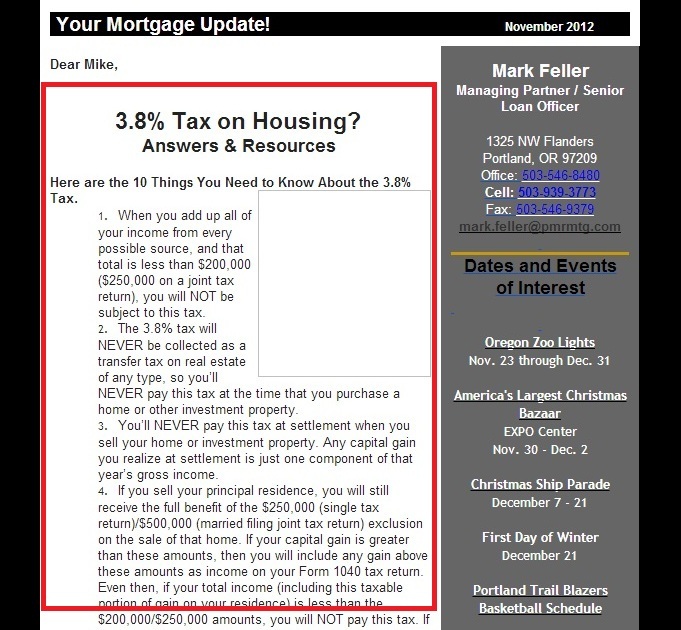 As you can see, there’s some good information here that explains the implications of the 3.8% housing tax. The newsletter was sent to several hundred current and former clients in his database. It probably generated some nice feedback and maybe even created a couple new deals. The content is not on his website, so he’s missing a big opportunity to reach a wider audience: People searching Google for more information on the Housing Tax. Archived newsletters provide only slightly better value than the example above. Portland lawyer Kate Brooke sends a monthly newsletter to clients and friends offering excellent advice and interesting stories based on her years of professional experience in the real estate industry. 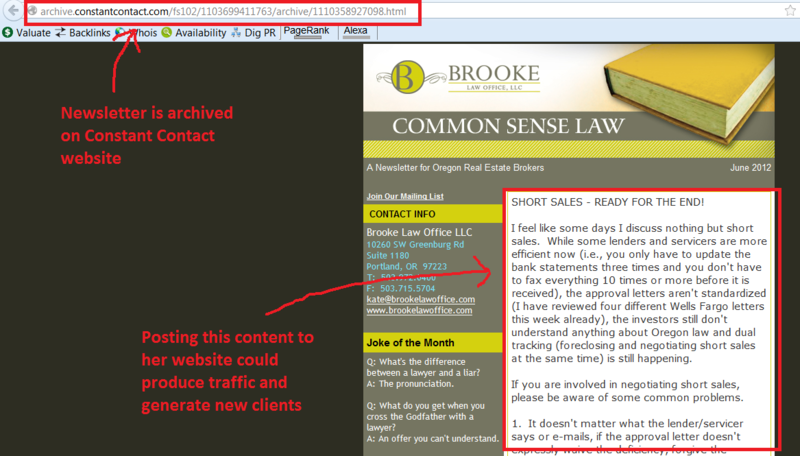 She also provides a link on her website so visitors can view her newsletter archives. When we click on the link; however, we find that all of Kate’s archived newsletters get stored on Constant Contact’s website, like the example below. This is no good in terms of generating new leads for Kate because the chances of this content ever being found in organic Google search results is almost zero. What I’d recommend is that she post each of her newsletters on her own website and then optimize them for search engines. Then her content would be widely available to Googler’s seeking answers and advice to what she’s writing about. The best way to handle newsletters with content is this: Don’t put the content in the newsletter at all. Put it in your blog and use your newsletter to promote it. I know, it seems a bit counter intuitive, but check out the example below from AWeber, a leading email marketing service provider. Notice how this newsletter is clean and simple. 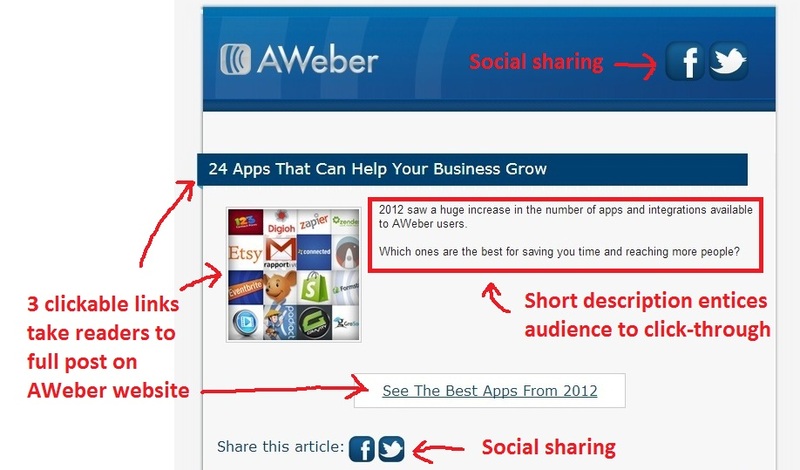 It can be that way because AWeber has posted their content on their blog, not in their newsletter. They entice readers to click-through to their website by using a short “teaser” description. Plus, business owners searching Google and Bing might find their “24 Apps That Can Help Your Business Grow” story online. All three of the clickable links/graphics take the reader directly to the blog post on AWeber’s website. And subtle social sharing options are included – this helps AWeber gain extra exposure as users share the content on their Facebook and Twitter pages. The photo below is an actual screen shot of a client’s Google Analytics data between October 2012 and January 2013. Can you guess which days they sent their email newsletter? Prior to October, the client was sending newsletters the old way – with all of their content inside the newsletter. Now, they send their newsletters following the AWeber example above and the difference in traffic is pretty clear. (Note the spike in December was much lower due to the holidays). The way I see it, every time you publish fresh content on your website, you’re giving Google more information about your site. Quality, content-rich sites rank better and produce far more leads than sites that are thin on content. Traffic. Converting to a model like the one AWeber uses, will yield you more traffic to your website. And anytime you get more traffic to your website, the better chance you have of selling them a service or getting them interested in other content. At a minimum, you’re creating a positive habit by having visitors connect and spend time on your site. Social Sharing. AWeber gets “likes” and “tweets” every time it sends a newsletter. That’s another lead source for them as it helps publicize their product. In the two other examples above, they don’t get any social media exposure and therefore have no chance of reaching new clients with their message. Audience. Since AWeber’s content is located on their website, they have a chance of being found by consumers searching Google. The first two examples have a limited audience – they are only reaching consumers in their database. Since you’ve already taken the time to write the content for your newsletter, you might as well use it in a way that gives you the biggest bang for your marketing buck – put it on your website! If you need help moving your newsletter content into a blog format so that you can generate new leads, call me or ask a question in the comments below. Setting up a system for getting this done can sure make life easy! Have you already moved to a system like this? What kind of results have you seen? It’s a good approach, because you have less limitations on what you can do once your subscriber arrives at your website. Therefore, it makes sense to send him over via email. I have included your article in my Email Marketing Tips Blogcarnival. Thanks for submitting it.